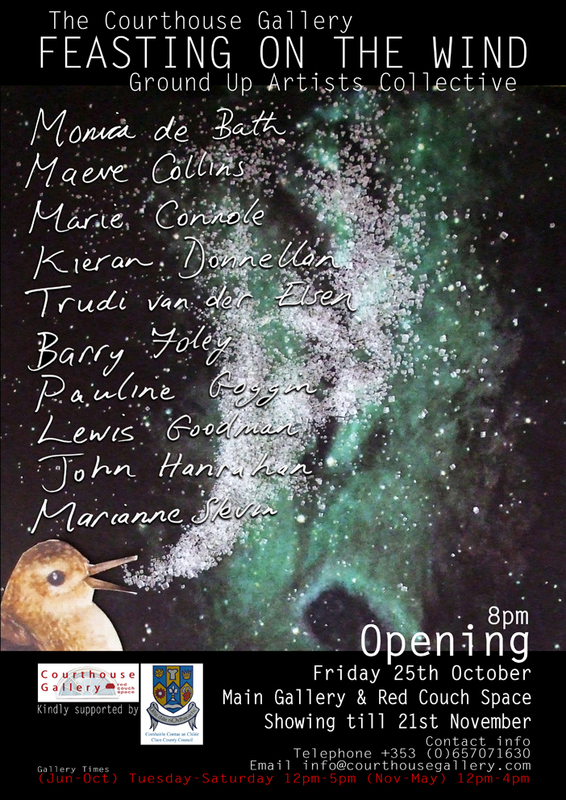 This year marks the 10th anniversary of the Ground Up Artists Collective (GUAC) and the Ennistymon Courthouse Gallery will play host to their annual members exhibition ‘ Feasting on the Wind’, opening on the 25th October. Throughout the years GUAC have been involved in a number of public interventions, inserting contemporary art into the rural environment to instigate debate and discussion between contemporary artists and the rural constituency. Members have come and gone leaving their own imprint on GUAC and the communities they worked with yet the issues of isolation, public engagement, contemporary practitioners coming together to inspire and inform one another remain an integral part of GUAC. This years’ exhibition consists of a core group of ten artists, Maeve Collins, Marie Connole, Barry Foley, Pauline Goggin, John Hanrahan, Trudi Van Der Elsen, Lewis Goodman, Marianne Slevin, Monica de Bath and Kieran Donnellan. A dynamic range of work encompassing architectural interventions, Photography of mental asylums, Painting, Sculpture, Animations, Video and Installation all come together to explore issues of isolation, connectivity, natural history, coastal & land use. This entry was posted in Current Projects, News. Bookmark the permalink.